The entire team at the Novotel Marne La Vallée Collégien hotel welcomes you to Marne-la-Vallée. Take advantage of our location to visit Seine-et-Marne or Disneyland® Paris. Treat yourself to a well-being stay in an Executive Room. The closest Novotel to Disneyland® Paris, 30 minutes from Paris, the Novotel Marne la Vallée Collégien is the ideal 4-star hotel for your stay in Marne La Vallée. 18 meeting rooms are available for your seminars and meetings. Air-conditioned throughout, t he hotel offers spacious rooms, a free car park, play areas, fitness center, an outdoor swimming pool and a renovated restaurant with a terrace. We can arrange your transfers during reservation (charged separately). The Novotel Marne la Vallée Collégien hotel is close to the Marne la Vallée Chessy TGV train station (10.6 miles/17 km) and to Paris via the RER A (1.9 miles/3 km). Easy access to the Val d'Europe shopping center and Outlet La Vallée Shopping center (10 km). Let yourself be carried away by the wonder of the 2 Disneyland® parks. 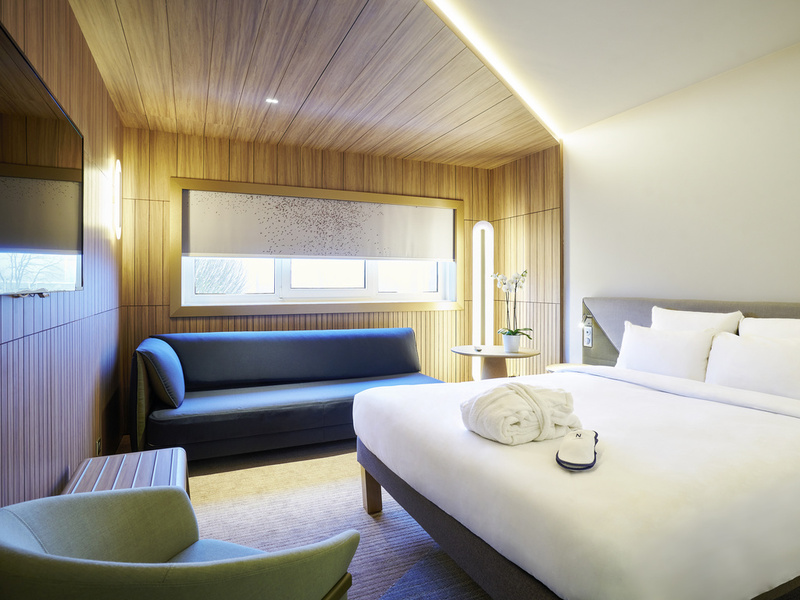 Spacious, contemporary and perfectly adaptable, the Novotel Room is a true living space and can be adapted to suit all requirements. All our rooms measure at least 269 sq. ft. (25 m²) and have queen-size beds measuring 63" (160 cm) and WIFI. All rooms have a bathtub or shower and separate toilet. Choose the Executive Room and enjoy a Nespresso coffee machine, walk-in shower, wellness kit with bathrobe and slippers and minibar. Family Superior Room - 1 double bed and 1 double sofa bed. "Chez Nous, On Cuisine Encore". Discover sophisticated cuisine that evolves with the seasons. The flavors are used with great elegance and the produce is fresh and cooked with precision. This gourmet break will delight your senses in an inviting setting. L'Instant Nomade offers tasty and balanced food in a unique, friendly and cosmopolitan atmosphere 24 hours a day. For something sweet or savory, or a cold drink, it offers the convenience of self-service at any time of the day or night. It was very good. The room was clean & perfect for our needs. We only stayed 1 night but had a delicious dinner in the restaurant and the buffet breakfast was varied & plentiful. Staff were polite and friendly. Hotel facilities and room were great - modern, clean, tidy and comfortable. The Sunday breakfast experience was however awful and spoiled our stay - stocks were not replenished, no cutlery, plates or cups. Staff did not respond to requests to bring out additional items when asked twice. Disappointed. Clean, comfortable, except for cooling. Lovely room, clean, bright, comfortable bed. However, the room was TOO HOT! We tried putting the AC on but only got a fan to blow. Opening the windows at night didn't help. Nice, clean room, good breakfast. The staff is the strongest point: available and kind. Room is correct, no surprise for the good and for the bad. Breakfast experience is weak, can be easily improved. i like to be recognized when I come back week after week, and I like the fact that the hotel has memorized my specific needs. F&B needs the strongest improvemnt , the menu is tasty ut not healthy. if it is true that the kitchen is still cooking, you should make available simple things like boiled and steamed veg, soups without cream, boiled chiken and boiled rice. If I have to tay with you all year long I don't wan tto increase my chances fro cancer!!! Globally very good experience. The only complain I can is related to the accoustic isolation of room. The noices coming from the outside and the corridor may be improved. Convenient and basic hotel near to Disneyland Paris. The room was fine, parking easy and reception friendly. The breakfast offering was poor and staff continually had to be prompted to make the basics (like fruit juices) available, which seemed to come as a surprise to them. My children did not enjoy it and it was not a friendly experience. TV lacked international channels, yes, I know it's France but a lot of your customers are not French. At checkout we had a major discussion with the person at the front desk at checkout. At the arrival at the 2nd of January. They mentioned that everything was ok. We did prepayment. But from the 1st of January there was a new tax. The total amount was 1,38€ which we paid then in cash. We got our key card for the room. With the mention that everything was ok. Until checkout. The girl at the front desk. (don't know her name). Really didn't listen what I say. Going from, you couldn't paid it yet because this is new tax. Which i answered her correct we paid this at you colleagues at arrival. Where she said that's not possible. I answered that we arrived at the 2nd of January, that her colleagues explained it and that we already paid it.I do understand that people will try everything to no pay. But we paid without any problem. Missing is a human thing and is possible. That her colleagues forgot to mention . That doesn't mean you have to be rude. Because of this discussion. I forgot to mention to validate the parking ticket. Where i went back in. I kindly asked to validate the ticket. Where she did this, because she couldn't do anything else without saying any words and not fully willing to help. When i told her to have a nice day in french. No respons. Where i said in dutch ook een prettige dag, which means have a nice day to. She said after me please in French, which I responded to hem, I say it also in English have a nice day. This ruin which was as always a nice stay. If the next time we come to the direction of Disneyland Paris. I will think twice befor I book. everything was perfect.I like it and my family also like it.The staff were very respictful and helpful.The breakfast was very good.The hotel was very clean.The free parking.The location is very good.I will stay on it again when I come back to Paris. Very comfortable experience. Room temperature controls do not work.